As a Texas gal, I have to admit that Tex-Mex is one of my favorite cuisines. Don't get me wrong, I love authentic Mexican food, too, but Tex-Mex has a solid place in my heart. 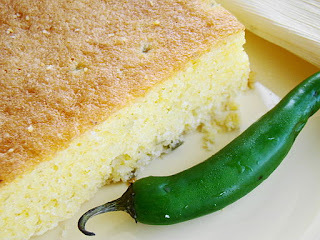 This delicious Jalepeño Cornbread is the perfect complement to the Tex-Mex Enchilada Bake I will be posting tomorrow. It is also great served with homemade chili, or any other Mexican food meal. This recipe came from my mother-in-law, Dorothy Pogue. Mix cornmeal, flour, salt and baking powder in a medium sized mixing bowl. In a small bowl, mix eggs, oil, milk, and cream-style corn and stir well. Pour the liquid mixture into the dry mixture and stir just until moistened well. If the mixture is too moist, add flour 1 tbsp. at a time until it has a good batter consistency. Fold peppers, onion, and cheese into the batter. Spray a 10" to 12" iron skillet or 10" to 12" pan with the canola oil spray. Pour batter into pan and spread to cover bottom evenly&mdashbe sure not to touch sides or bottom, as this may cause bread to stick in the pan. Bake at 420° about 20 minutes or until the top is golden brown and the center is done. Test with a sharp knife or toothpick, if necessary.